Gabriel Coulet, back in 1872 set out to start a wine cellar in the caves underneath his house, in his quest he learned that the caves offered a natural ventilation which was ideal for aging cheese ... and so it began. For the production of this French gourmet cheese, the AOC regulations require the use of whole, raw sheep's milk coming from within the Roquefort region, and from the ewe's of the Lacaune breed. The area is famous for its limestone geology, which dictates the species of grass and wild flowers that grow upon it, and this influences the taste of the milk which lends itself to the slight aroma of hay. This semi-soft cheese is moist, called weeping; it has a sweet, nutty flavor with a slight sharp bitterness. Such an exemplary Roquefort, worthy of its multiple awards. 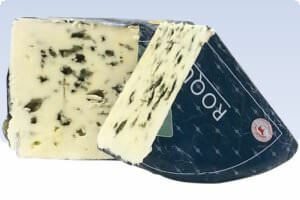 Roquefort is a very reliable addition to and will add a pop of flavor to any salad or proudly served as a dessert cheese. To really get the full flavor of this delicious cheese - crumble on a fresh just off the grill steak or atop a crusty bread with your favorite drink. We hand-cut and wrap this gourmet cheese in wedges of 8 ounces and 1 pound. Ingredients:whole ewe's raw milk, salt, lactic starters, animal rennet, Penicillium roqueforti.